Spleen tyrosine kinase (Syk) is involved in the development of the adaptive immune system and has been recognized as being important in the function of additional cell types, including platelets, phagocytes, fibroblasts, and osteoclasts, and in the generation of the inflammasome. Preclinical studies presented compelling evidence that Syk inhibition may have therapeutic value in the treatment of rheumatoid arthritis and other forms of arthritis, systemic lupus erythematosus, autoimmune cytopenias, and allergic and autoinflammatory diseases. In addition, Syk inhibition may have a place in limiting tissue injury associated with organ transplant and revascularization procedures. Clinical trials have documented exciting success in the treatment of patients with rheumatoid arthritis, autoimmune cytopenias, and allergic rhinitis. While the extent and severity of side effects appear to be limited so far, larger studies will unravel the risk involved with the clinical benefit. Spleen tyrosine kinase (Syk) is a cytoplasmic tyrosine kinase of 72 kDa and a member of the ZAP70 (ζ-chain-associated protein kinase of 70 kDa)/Syk family of the non-receptor-type protein tyrosine kinases (PTKs) [1, 2] and contains two SRC homology 2 (SH2) domains and a kinase domain . Syk is expressed in most hematopoietic cells, including B cells, immature T cells, mast cells, neutrophils, macrophages, and platelets [1, 3, 4], and is important in signal transduction in these cells [2, 5]. 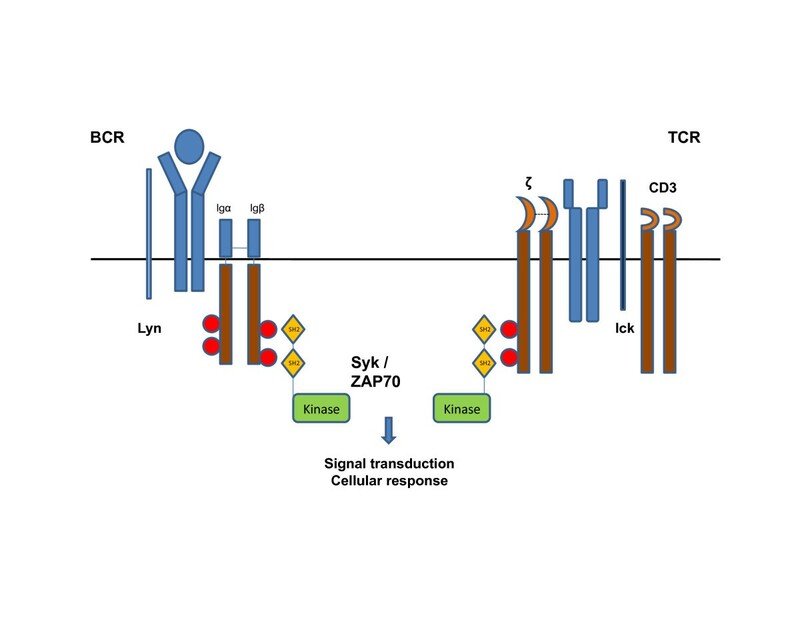 Syk plays an important role in signal transduction initiated by the classic immunoreceptors, including B-cell receptors (BCRs), Fc receptors, and the activating natural killer receptors [3, 6, 7]. Syk is associated mainly with ITAM (immunoreceptor tyrosine-based activation motif)-dependent pathways and affects early development and activation of B cells, mast cell degranulation, neutrophil and macrophage phagocytosis, and platelet activation [1, 3, 4]. Functional abnormalities of these cells are invariably associated with both autoimmune and allergic diseases. Although there have been many exciting developments in the treatment of these diseases, there are still serious limitations of the efficacy of the used drugs as they are associated with the development of serious side effects. 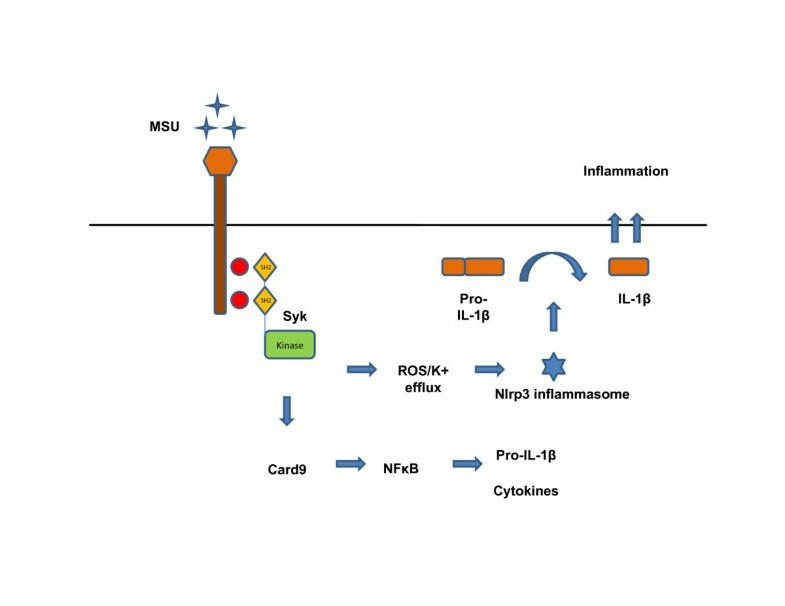 Because of the central role of Syk in signaling processes not only in cells of the adaptive immune response but also in additional cell types known to be involved in the expression of tissue pathology in autoimmune, autoinflammatory, and allergic diseases, Syk inhibition has attracted considerable interest for further development. In this review, we will provide a brief account of the role of Syk signaling in various cell types and will summarize preclinical and clinical studies, which point to the therapeutic usefulness of Syk inhibition. The function of Src-family kinases and Syk kinases in immunoreceptor signaling pathways is well known (Figure 1) . After receptor engagement, Src-family kinases phosphorylate the ITAMs of immunoreceptors and this results in the recruitment and activation of Syk [6, 7]. BCR- and FcR-defined dual-phosphorylated ITAMs recruit Syk through interaction with their tandem SH2 domains, and this triggers kinase activation and down-stream signaling [4, 8]. Structure of spleen tyrosine kinase (Syk) protein. Syk includes two tandem SH2 domains and a tyrosine kinase domain. 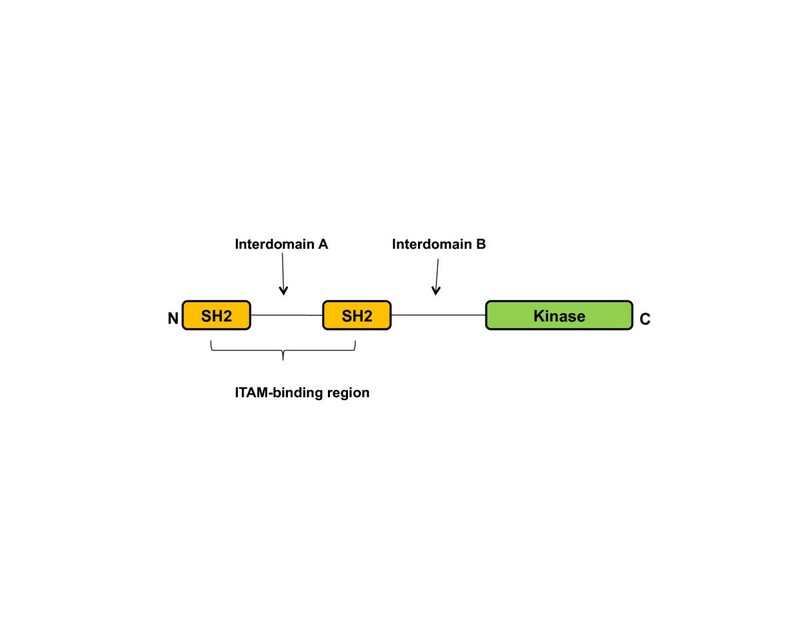 Interdomain A is between the two SH2 domains, and interdomain B is between the tyrosine kinase domain and C-terminal SH2 domain. ITAM, immunoreceptor tyrosine-based activation motif; SH2, Src homology 2. Because the development of B and T cells requires intact antigen receptor-mediated signal transduction, Syk deficiency leads to a complete absence of mature B cells, and ZAP70 deficiency results in severe T-cell defects [9, 10]. Syk plays an important role in the transition of pro-B cells into pre-B cells . Although it was previously thought that BCR signaling was mediated via Syk and T-cell receptor (TCR) signaling via ZAP70, recent data have shown that ZAP70 has a role in B-cell development and Syk is important in pre-T cell signaling (Figure 2) [11, 12]. It appears that Syk and ZAP70 have overlapping roles in early lymphocyte development [11, 12]. Spleen tyrosine kinase (Syk)-mediated signaling in B-cell receptor (BCR) and T-cell receptor (TCR). Upon engagement of BCR or TCR, Syk or ZAP70 is recruited to plasma membrane receptors. Activated Syk/ZAP70 phosphorylates ITAM tyrosines. Signal transduction is initiated by phosphorylation of ITAM tyrosines. ITAM, immunoreceptor tyrosine-based activation motif; SH2, Src homology 2; ZAP70, ζ-chain-associated protein kinase of 70 kDa. For the transmission of BCR-mediated cell signaling events, subsequent activation of different types of PTKs, including Syk, is required . BCR aggregation can directly stimulate activation of pre-associated Syk, resulting in tyrosine phosphorylation of Igα-Igβ ITAMs [6, 14, 15]. This phosphorylation leads to recruitment of additional Syk. Subsequently, recruited Syk is activated by Src-PTK-dependent transphosphorylation and by autophosphorylation [6, 14]. Therefore, Syk is necessary for BCR-mediated tyrosine phosphorylation and signal transduction [6, 15]. FcγR, one of the classic immunoreceptors, typically engages Syk [3, 7, 16, 17], and Syk-deficient murine macrophages display defective phagocytosis [7, 16]. After FcγR engagement, ITAMs in the receptor are phosphorylated by Src-family kinases, resulting in the recruitment and activation of Syk. As a result, Syk-mediated phosphorylation of several adaptor proteins causes activation of downstream pathways, which execute phagocytosis. Syk is also important in complement-mediated phagocytosis resulting from the binding of C3bi-coated particles to complement receptor 3 [3, 17]. Downstream of Syk, the signal involves Vav and RhoA to generate contractile forces, which result in the engulfment of the phagocytosed particles [3, 17, 18]. FcεRI, the high-affinity surface receptor for IgE, is expressed on the surface membrane of mast cells, and crosslinking of receptor-bound IgE by multivalent antigen starts the activation of mast cells by promoting the aggregation of FcεRI [19, 20]. Degranulation and cytokine release occur after the activation signal starts the cascade . These events contribute to the development and continuation of allergic inflammation. Syk plays an important role in the development of signal transduction events initiated after FcεRI aggregation [2, 21], mast cell activation, degranulation, and cytokine production (Figure 3) [22, 23]. All of these facts point to the conclusion that Syk inhibition might be an attractive target for preventing allergen-induced diseases. FcεR crosslinking by allergen involves spleen tyrosine kinase (Syk)-mediated signaling transduction. Allergen binding to IgE bound to FcεR on mast cell initiates Lyn phosphorylation of the receptor and activation of Syk. Signaling events lead to mast cell degranulation, eicosanoid mediator synthesis, and cytokine production. FcεR, Fc receptor ε-chain; SH2, Src homology 2. There are three platelet surface molecules, which, upon engagement, initiate Syk-mediated activation of SLP76 (SH2 domain-containing leukocyte proteins 76) and phospholipase Cγ2 (Figure 4) [24, 25]: (a) Platelet/megacaryocyte lineage cells express the platelet-specific integrin αIIbβ3 on their surface and this is required for normal hemostasis . Syk mediates outside-in signaling by αIIbβ3 integrin on platelets [26, 27]. The mechanism of Syk activation by αIIbβ3 integrin was reported to require the ITAM-containing FcγIIA molecule . (b) Glycoprotein VI (GPVI), a major collagen receptor of platelets, is an FcγR-related receptor and is closely associated with FcαRs . 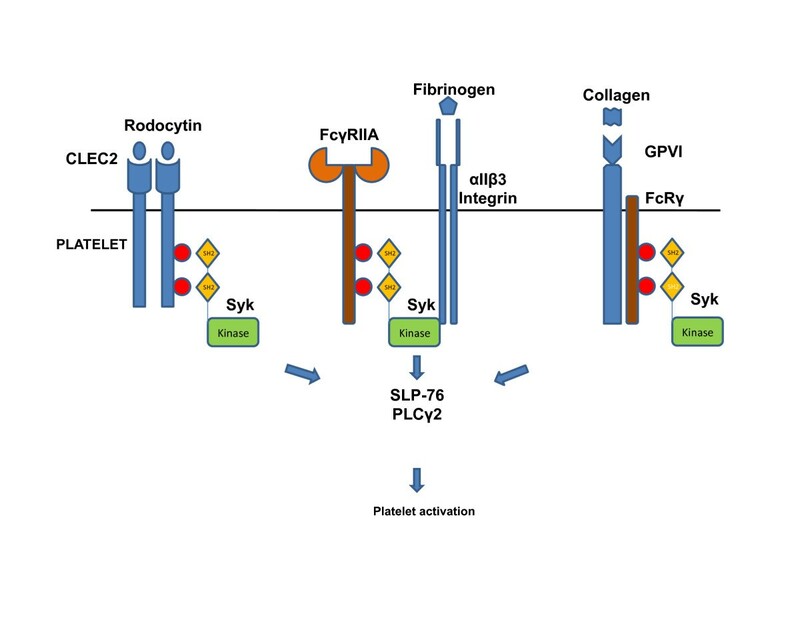 Collagen activates the FcγR-associated receptor GPVI on platelets and triggers Syk activation in an ITAM-dependent way [24, 28]. SLP76, a Syk substrate, is required for arterial thrombus formation . (c) Platelet agonists like rhodocytin and podoplanine activate the receptor C-type lectin-like receptor 2 (CLEC2), which recruits Syk to the phosphorylated tyrosine in the CLEC2 ITAMs [4, 28]. Spleen tyrosine kinase (Syk)-mediated signal transduction in platelets. Signal transduction pathways are mediated through αIIbβ3 integrin/FcγRIIA, CLEC-2, and GPVI/FcRγ. GPVI and αIIbβ3 use ITAM, whereas CLEC2 uses atypical ITAM. These three pathways of Syk activation result in platelet activation through SLP76 and PLCγ2. CLEC2, C-type lectin-like receptor 2; FcRγ, Fc receptor γ-chain; GPVI, glycoprotein VI; ITAM, immunoreceptor tyrosine-based activation motif; PLCγ2, phospholipase Cγ2; SH2, Src homology 2; SLP76, SH2 (Src homology 2) domain-containing leukocyte protein 76. Syk is required for the separation of lymphatic vessels in the general circulation [9, 29]. Syk-deficient mice die because blood fills the lymphatic vessels . Probably, Syk activation together with platelet activation and aggregation play a role in lymphatic vessel development and their separation from blood vessels [4, 9]. Osteoclasts are multinucleated cells that degrade bone by releasing proper enzymes. Syk has been claimed to have a role in osteoclast differentiation and osteoclast function [3, 4]. Although FcγR is associated with osteoblast-osteoclast interactions, DAP12 (DNAX-activating protein of molecular mass 12 kDa) is the responsible protein for relaying an osteoblastindependent signal [30, 31]. Syk, which is downstream of DAP12 and FcγR, is required for osteoclast development and function (Figure 5) [30, 32]. DAP12 phosphorylation recruits Syk through its SH2 domain, leading to autophosphorylation. Phosphorylated Syk associates with cytoskeleton network and actin ring formation . In addition, it was reported that Syk plays a role in the process of osteolysis. Syk, therefore, represents an attractive therapeutic target to mitigate increased osteoclastic activity in arthritis. Model of the role of spleen tyrosine kinase (Syk) in osteoclastogenesis. 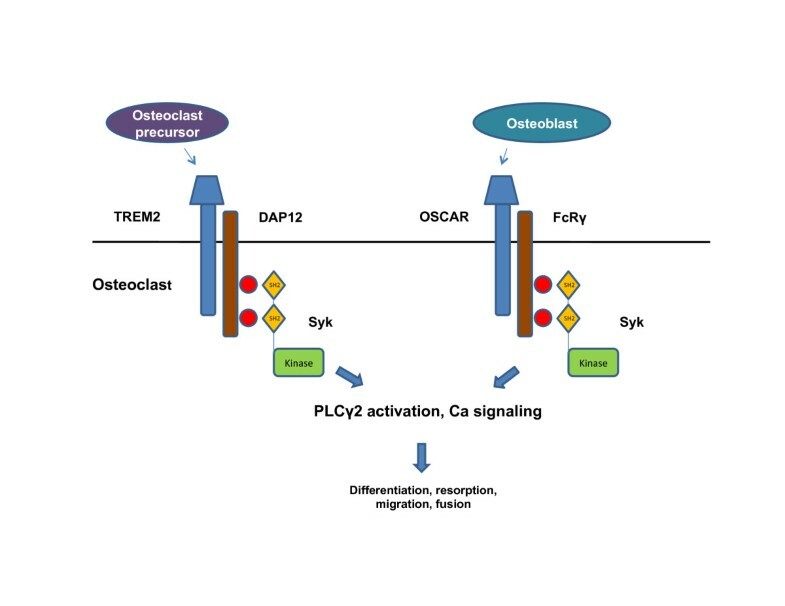 Osteoclast differentiation and function are stimulated by signals from ITAM-bearing adapter chains. DAP12 associates with TREM2, and similarly OSCAR associates with FcγR chain. After ligation of the extracellular domain of the receptor, DAP12 or FcRγ is tyrosine-phosphorylated by Syk. Activation of Syk initiates a number of signaling events. DAP12, DNAX-activating protein of molecular mass 12 kDa; FcRγ, Fc receptor γ-chain; ITAM, immunoreceptor tyrosine-based activation motif; OSCAR, osteoclast-specific activating receptor; PLCγ2, phospholipase Cγ2; SH2, Src homology 2; TREM2, triggering receptor expressed on myeloid cells. Fibroblast-like synoviocytes (FLSs) represent a significant component of the synovial lining and contribute to the lubrication and preservation of the joint. In rheumatoid arthritis (RA), FLSs expand in numbers, acquire immune cell features, produce proinflammatory cytokines and enzymes, and contribute to the inflammatory process and the eventual destruction of the joint. A number of studies have claimed a role for Syk in the function of FLSs [33, 34]. Syk activation is important in tumor necrosis factor-alpha (TNFα)-induced cytokine and metalloproteinase (MMP) production by RA FLSs . Syk also plays an important role in TNFα-induced c-Jun N-terminal kinase (JNK) activation in FLSs . This is an important event as in the future Syk inhibition may be used to supplement the therapeutic effect of TNF inhibition in patients who do not display sufficient response to TNF blockade. Activation of Syk by TNFα causes the activation of the protein kinase Cδ/JNK/c-Jun signaling pathway and this is important for the secretion of a critical cytokine, interleukin-32 (IL-32), by RA FLSs . Although the exact mechanisms of action remain unclear, Syk inhibitors have claimed encouraging therapeutic results in the treatment of patients with allergy, autoimmune diseases, or B-cell lineage malignancies [23, 35, 36]. R406, an orally available active metabolite of the prodrug R788 (fostamatinib), is a competitive Syk inhibitor [37, 38]. The selectivity for R406 in inhibiting Syk is limited as it may inhibit additional kinases and non-kinase targets. Among those targets are FMS- related tyrosine kinases 3 (FLT3), Lck, and Janus kinase 1 (JAK1) and JAK3, which may also be involved in the expression of autoimmune pathology . These non-Syk targets may enhance the clinical value of R406 in the treatment of autoimmune diseases as JAK inhibitors have been considered for the treatment of arthritis. R112 is another Syk inhibitor formulated for intranasal use  and has a rapid effect and quickly inhibits mast cell activation. Additional Syk inhibitors with less specificity include piceatannol and BAY 61-3606 [40, 41]. Despite enormous advances in the treatment of RA, a significant number of patients either fail to respond to treatment or develop significant side effects. Based on a number of laboratory findings and preclinical studies, including the fact that RA synovium displays increased amounts of phosphorylated Syk compared with osteoarthritis synovium , significant effort is currently being devoted to determine whether Syk inhibition can be used to treat patients with RA (Table 1). Response rate was not different from that of placebo. ACR20, American College of Rheumatology 20% improvement criteria; ACR50, American College of Rheumatology 50% improvement criteria; ACR70, American College of Rheumatology 70% improvement criteria; MTX, methotrexate; RA, rheumatoid arthritis. Strong preclinical studies point to the therapeutic potential of Syk inhibition. Syk-deficient bone marrow murine chimeras do not allow the development of arthritis following the injection of arthritogenic K/BxN serum , suggesting the importance of hematopoietic cell Syk-dependent signaling in the development of arthritis. Administration of R406 reduced clinical arthritis in two antibody-induced arthritis models (K/BXN serum and collagen antibody). In addition, R406 suppressed bone erosions detected by radiography, pannus formation, and synovitis in these animal models . It was also observed that the expression of Syk in synovial tissues correlated with the levels of inflammatory cell infiltrates in the joints and was virtually undetectable in R406-treated mice subjected to collagen-induced arthritis in rats . In addition, Syk inhibition reduced synovial fluid cytokine levels and cartilage oligomeric matrix protein in serum in these animals . R406 was also found to limit an Arthus reaction in mice  and rats  and reverse passive Arthus reaction in murine chimeras with Syk-deficient hematopoietic cells [43, 44]. This effect is probably due to the suppression of immune-complex-mediated inflammation by inhibiting the Fc receptor signaling. After a small phase I study  in which clinical efficacy of the R788 Syk inhibitor in patients with RA was not associated with serious side effects, a 12-week, randomized, placebo-controlled trial in which active RA patients who were also receiving methotrexate (MTX) were enrolled was carried out . Twice-daily oral doses of 100 and 150 mg of R788 were demonstrated to be significantly superior to placebo and 50 mg twice a day of R788. Interestingly, the clinical effect was noted as early as 1 week after the initiation of treatment. Patients receiving 100 and 150 mg R788 achieved excellent ACR20 (American College of Rheumatology 20% improvement criteria) (65, 72%), ACR50 (49, 57%), and ACR70 (33, 40%) responses. Also, significant reductions in serum IL-6 and MMP-3 levels were noted within the first week of treatment. Diarrhea and other gastrointestinal adverse effects such as nausea and gastritis, neutropenia, and elevation in transaminase level were the reported major side effects. In the follow-up study, 100 and 150 mg (twice daily) of R788 were compared with placebo at 6 months in 457 active RA patients who were MTX incomplete responders . The ACR20 response was achieved in 66% and 57% of patients in the 100 and 150 mg groups, respectively, compared with 35% in the placebo group. Both R788 dosing regimens achieved statistical significance compared with placebo at the sixth month. In this study, the onset of clinical effect was again rapid with maximum improvement achieved by week 6 and maintained throughout the study. The most common side effect was reversible and dose-dependent diarrhea. Transient neutropenia, hypertension, and elevation of liver function tests were also recorded. Another randomized placebo-controlled phase II study was conducted in 219 RA patients who had failed treatment with at least one biologic agent . Patients received either 100 mg (twice daily) of R788 or placebo. ACR20 response and magnetic resonance imaging (MRI) images of the hands and wrists were evaluated 3 months later. There was no statistical difference in the ACR20 response between the two groups. However, a significant decrease in erythrocyte sedimentation rate and C-reactive protein and improvement in synovitis and osteitis scores on MRI were observed in the R788 group compared with the placebo group. In systemic lupus erythematosus (SLE), the FcγR-Syk associates with the TCR in lieu of the zeta-chain ZAP70 . This rewiring of the TCR has been claimed to account, at least partly, for the overactive T-cell phenotype observed in SLE . In addition, the pathogenesis of SLE has been associated with B-cell activation in which Syk may play an important role. Therefore, Syk inhibition therapy was used in lupus animal models (Table 2). Long-term (24 to 34 weeks) administration of R788 to lupus-prone NZB/NZW mice before and after disease onset  resulted in delayed onset of proteinuria and renal dysfunction, decreased kidney infiltrates, and prolonged survival in these mice. Although antibody titers were minimally affected, a dose-dependent reduction in the numbers of CD4+ activated T cells expressing high levels of CD44 or CD69 in spleens from R788-treated mice was noted. Arthus responses were also reduced in NZB/NZW mice pretreated with R788. Also, a Syk inhibitor was reported to reduce the severity of established antibody-mediated experimental glomerulonephritis in rats . Treatment of lupus-prone MRL/lpr and BAX/BAK mice with R788 not only prevented the development of skin and renal pathology but also treated established disease . Syk inhibition reduced splenomegaly and lymphadenopathy and other immune parameters. The fact that Syk inhibition suppresses SLE in at least three lupus-prone mice suggests that Syk inhibition in patients with SLE may be of clinical value. Mainstay therapy for allergic diseases remains avoidance of allergens and allergen-specific immunotherapy . However, allergen avoidance and immunomodulation therapies are usually impractical, complex, and time-consuming . Targeting activation of mast cells to prevent release of mediators represents an important treatment alternative [20, 39, 52, 53]. An effective way to inhibit the production and release of all mast cell mediators should aim at interfering with the action of IgE by blocking the FcRε with biologics [20, 23]. Alternatively, targeting the intracellular signaling cascade may represent an attractive approach. Appropriately, protein tyrosine kinases such as Syk, Lyn, and Btk have been directly implicated in IgE-dependent mast cell activation and have been suggested as targets for therapeutic intervention [39–41]. 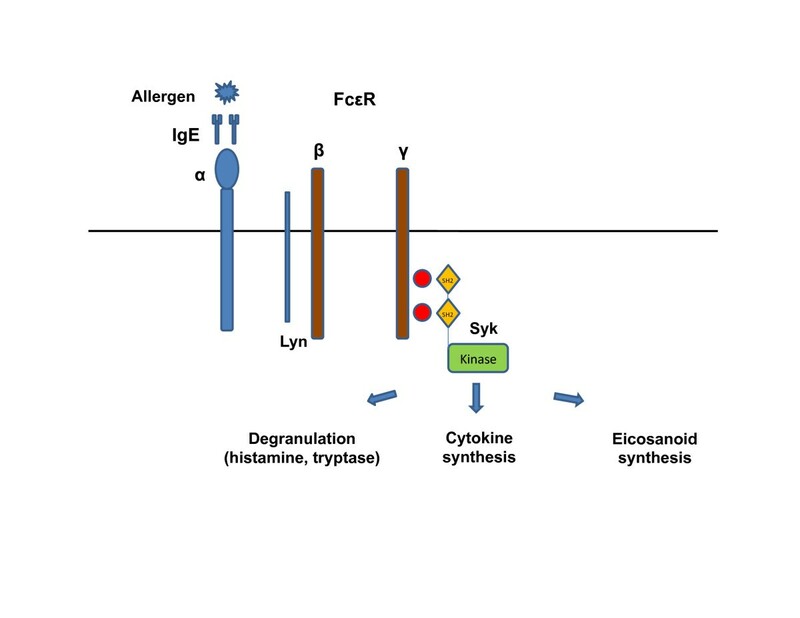 Syk represents the most attractive target because studies with mast cells derived from Syk-deficient indicated mice showed that Syk is important in the activation of mediators of degranulation, eicosanoid, and cytokine production [23, 39]. Syk inhibition therapies in allergic diseases are summarized in Table 3. Suppressed antigen-induced passive cutaneous reaction, bronchoconstriction, bronchial edema, and airway inflammation. Seow and colleagues  examined the effect of piceatannol, a Syk inhibitor, on ovalbumin-induced anaphylactic contraction of isolated guinea pig bronchi and release of histamine and peptidoleuketrienes in vitro. Piceatannol pretreatment slightly suppressed peak anaphylactic bronchial contraction but facilitated relaxation of the contracted bronchi. Piceatannol did not inhibit direct histamine-, leukotriene D4-, or KCl-induced bronchial contraction or revert an existing anaphylactic bronchial contraction but did significantly prevent ovalbumin-induced release of both histamine and peptidoleuko-trienes from lung fragments. But piceatannol did not inhibit exogenous arachidonic acid-induced release of peptidoleukotrienes from lung fragments. In an antigen-induced airway inflammation model in rodents, the Syk inhibitor BAY 61-3606 blocked both degranulation and lipid mediator and cytokine synthesis in mast cells and suppressed antigen-induced passive coetaneous reaction, bronchoconstriction, bronchial edema, and airway inflammation . R406 inhibited pulmonary eosinophlia, goblet cell metaplasia, and airway hyper-responsiveness (AHR), which developed in BALB/c mice exposed to aerosolized 1% ovalbumin for 10 consecutive days . In addition, treatment with R406 suppressed the presence of eosinophils and lymphocytes and IL-13 in bronchoalveolar lavage fluid. Suppression of Syk in bone marrow-derived dendritic cells was considered important in the suppression of AHR. This preclinical information has justified attempts to determine whether Syk inhibition may have clinical value. Syk inhibition has tried in patients suffering of allergic disorders to determine whether it mitigates clinical manifestations. A nasal allergen challenge study in volunteers with allergic rhinitis showed that one intranasal dose of R112 is clinically safe and significantly reduces the level of prostaglandin D2, a key mediator of allergic nasal congestion, but not histamine and tryptamine levels . In this 2-day, multiple-dose, double-blind, placebo-controlled clinical study with seasonal allergic rhinitis patients, R112 significantly decreased the global clinical symptom score compared with placebo. Each individual symptom, like sneezing, stuffiness, itching, runny nose, cough, postnasal drip, facial pain, and headache, was also significantly improved in the R112 group compared with control treatment. The most important feature of R112 was noted to be the rapid onset of action. Within 45 minutes, rhinitis symptoms were relieved by using R112, and the duration of action extended to 4 hours. It appears that larger studies to validate the efficacy of Syk inhibition in the treatment of allergy are in order. In patients with immune thrombocytopenic purpura (ITP), there is an accelerated clearance of circulating IgG-coated platelets through Fcγ receptor-bearing macro-phages in the spleen and the liver . Syk inhibition should limit platelet destruction in patients with ITP, probably by blocking FcγR signaling. Injection of mice with an antibody directed to integrin αIIb leads to profound thrombocytopenia, which is prevented in mice pretreated with R788 . Also, pretreatment with Syk inhibitors prevented anemia in a mouse model of auto-immune hemolytic anemia (AHA) . At the clinical level, treatment of a small number of patients (n = 12) suffering from ITP with an R406 led to therapeutic success. Specifically, in 8 patients, the clinical response was sustained, whereas in the remaining 4, the response was of limited duration. Obviously, larger studies are needed to determine clinical efficacy. Because hematopoietic cells are involved in the expression of intestinal ischemia-reperfusion injury (IRI), we investigated the ability of R788 to protect mice against IRI . Mice were fed with Syk inhibitor (3 or 5 g/kg day) for 6 days before intestinal IRI was performed. We observed that R788 significantly suppressed both local intestinal and remote lung injury. The beneficial effect was associated with reduced IgM and complement 3 deposition to the affected tissues and significant reduction of polymorphonuclear cell infiltration. The value of this study is that it extends the clinical range of the therapeutic value of Syk inhibitors to conditions involving IRI, such as organ transplant and coronary and carotid revascularization. Recent studies have revealed essential roles for Syk in the inflammasome production of cytosolic Nlrp3 (NLR family pyrin domain-containing 3) [58, 59]. Syk signaling is important for the production of reactive oxygen species and gene transcription factors important in the expression of proinflammatory factors like IL-1β. Pro-IL-1β synthesis is regulated by the Syk-caspase recruitment domain 9 (Syk-Card9) pathway (Figure 6) . Mechanisms of monosodium urate (MSU)-mediated inflammation and the roles of spleen tyrosine kinase (Syk) and Nlrp3. MSU signals activate Nlrp3 inflammasome. Syk plays important roles in both pro-IL1β synthesis and Nlrp3 activation in response to MSU. Pro-IL1β synthesis occurs through the Syk-Card9 pathway. However, Nlpr3 activation is regulated through a Syk-dependent, mostly Card9-independent mechanism. Card9, caspase recruitment domain 9; IL1β, interleukin-1-beta; NF-κB, nuclear factor-kappa-B; Nlrp3, NLR family pyrin domain-containing 3; SH2, Src homology 2. Nlrp3 inflammasome has been shown to be involved in monosodium urate (MSU)-mediated activation of monocytes . It was reported that the MSU-triggered inflammatory response requires Nlrp3 and adaptor protein apoptosis-associated speck-like protein containing Card . MSU causes strong Syk tyrosine phosphorylation in human neutrophils, which can be suppressed in the presence of piceatannol . Apparently, Syk is required for MSU-mediated activated protein kinase activation and IL-1β production, and Syk recruitment leads to Card9 activation, which controls pro-IL-1β synthesis (Figure 6) [58, 60, 61]. Card9 has been known to mediate events downstream of Syk in ITAM-mediated activation . These studies have generated a rationale for the use of Syk inhibitors in the treatment of crystal-induced arthritis and other autoinflammatory diseases. Syk, initially recognized as a critical signaling molecule in mast cells and lymphocytes, has been documented to be important in the function of additional cells like platelets, monocytes, macrophages, and osteoclasts. As all of these cells are involved in the instigation and establishment of tissue pathology in autoimmune allergic and autoinflammatory diseases, Syk inhibition has gained significant interest as an important therapeutic tool. Preclinical evidence argues convincingly that patients suffering from diseases such as RA, SLE, ITP, and AHA and allergic rhinitis stand a good chance to benefit from Syk inhibition. Interestingly, reperfusion injury, which follows ischemia in mice, is greatly suppressed by Syk inhibitors, extending the range of diseases with possible clinical benefit to organ transplantation and revascularization procedures. The clinical experience is limited to patients with RA and ITP. Yet the rapidity of action and the extent of clinical improvement call for further clinical trials. Obviously, there are serious questions that need attention. Is Syk involved in the function of additional cells? What other kinases or non-kinase molecules are targeted by the available Syk inhibitors? Can medicinal chemistry enable the development of inhibitors that are more specific? The RA trial noted several, albeit manageable, side effects. Do the noted side effects hint at additional unrecognized target molecules affected by the used Syk inhibitor? Do the side effects point to the presence of Syk in additional cells (for example, intestinal epithelial cells). The recorded hypertension in patients treated with the Syk inhibitor needs special consideration. We believe that now that Syk inhibitors have earned a place in the line of drugs to be further developed for clinical use, effort should be invested to further understand the mechanism of inhibition of Syk enzymatic activity in an effort to derive compounds with increased specificity. The need to further study cells and processes controlled by Syk is exemplified by a recent report in which a Syk-positive myeloid population of cells stimulates lymphangiogenesis in vivo and disruption of Syk among others is associated with inappropriate homing of leukocytes . The RA clinical trial noted a prompt clinical improvement in patients receiving background treatment. Can Syk inhibitors be used in monotherapy? Does prolonged treatment preserve the clinical benefit, and if so, for how long? Does discontinuance of treatment result in a prompt rebound of disease? Do existent erosions heal? The current trend in RA trials remains the parallel administration of biologics in conjunction with MTX to patients who fail MTX. This has led to the development of a number of biologics, many of which belong to the same category. For example, several anti-TNF biologics are already available for the treatment of patients with RA. Should Syk inhibitors attain approval for the treatment of RA, an opportunity may arise (provided that the cost is not too high) to try them in tandem with the biologics or as therapeutic adjuvant to biologics. Should trials in patients with SLE, ITP, AHA, or gout be initiated, a similar and probably longer list of questions should be addressed. The report on the beneficial effect of Syk inhibition in IRI begs for additional preclinical studies to determine the role of Syk inhibition in organ transplant and other models of IRI, such as muscle, heart, and liver. ζ-chain-associated protein kinase of 70-kDa. Work in the GCT lab was supported by PHS R01 AI42269, DoD W81XWH-09-1-0530, and a grant from Rigel Pharmaceuticals (South San Francisco, CA, USA). ONP was supported by a Scientific and Technological Research Council of Turkey (TUBITAK) scholarship.